I have been using natural toothpaste for a few years now. However, I wasn’t always so keen on the idea of fluoride-free toothpaste. Truthfully, the first few natural toothpastes I tried (back when there were only a couple brands available) were really gross. Sorry to sound dramatic, but they really were not good at all. Fast forward to today, more companies have joined in on the natural toothpaste trend. Now you can choose from many different natural toothpaste brands. That’s why I decided to give natural toothpaste another try. I found there have been major improvements in flavor, texture and (so importantly) the after taste of natural toothpaste. 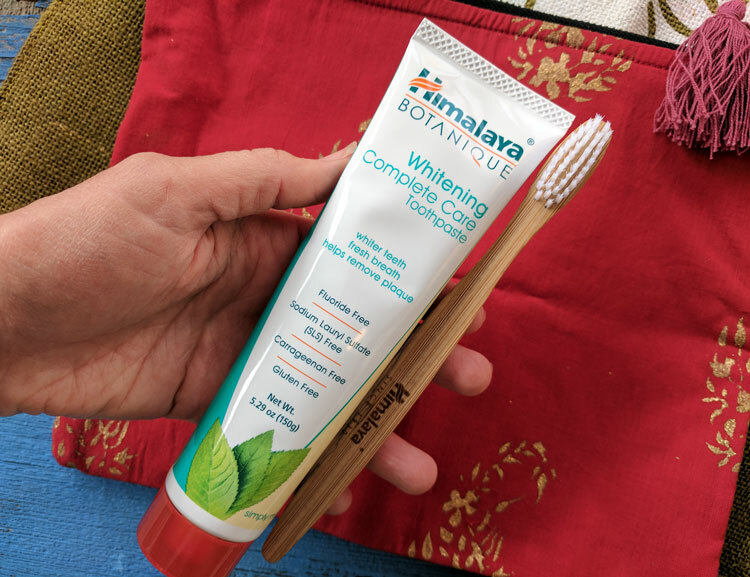 A new brand to me that I LOVE is Himalaya Botanique Toothpaste. The biggest shocking fact is that my husband actually likes this natural toothpaste too! I never thought I would see the day when we shared the same toothpaste tube! 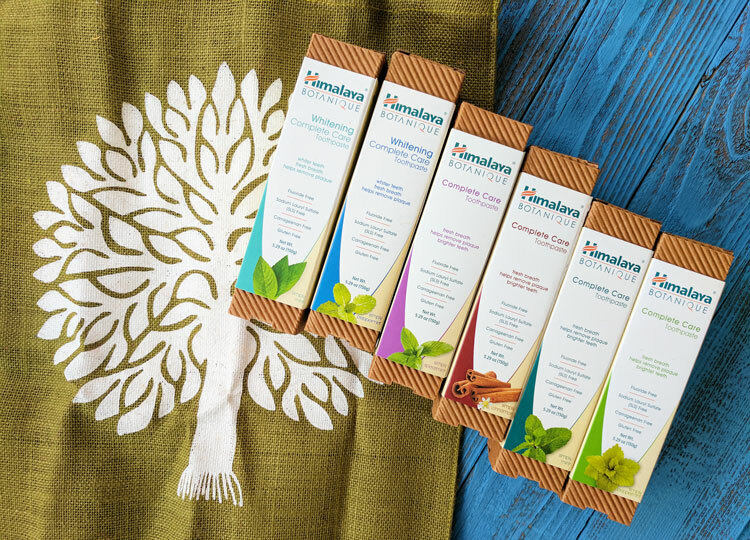 Himalaya Botanique offers a full line of clinically studied herbal formulations, certified USDA organic single herbs and body care products. 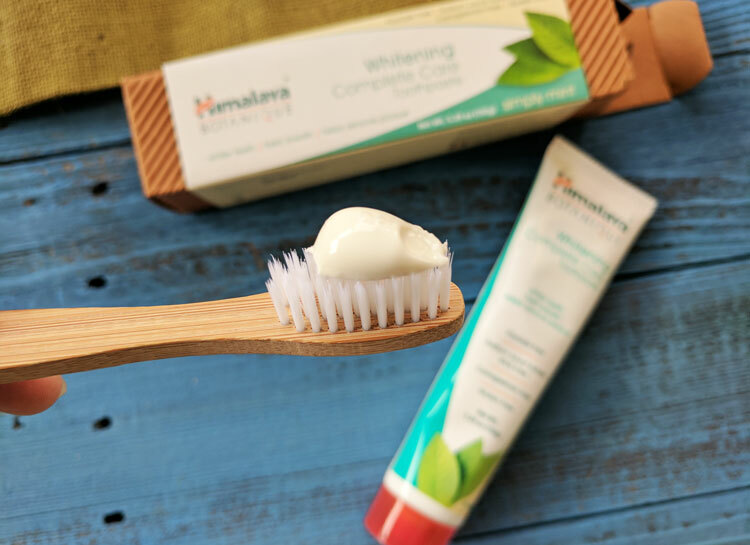 Specifically focusing on the Himalaya Botanique Complete Care Toothpaste, this product is free from harmful ingredients like, Carrageenan, Fluoride and SLS. They have 7 different flavors: Whitening Complete Care Simply Peppermint, Whitening Complete Care Simply Mint, Complete Care Simply Peppermint, Simply Mint, Simply Cinnamon, Simply Spearmint and the Original Neem and Pomegranate toothpaste. – all 7 varieties are Gluten Free. Some of the ingredients that Himalaya uses is neem leaf (cleans), pomegranate (supports healthy gums), triphala (traditional detox formula), xylitol (clinically-studied oral hygiene support) and papain and bromelain, the enzymes from papaya and pineapple (to help remove surface stains). I’ve enjoyed the Himalaya toothpaste flavors that I have tried so far. The toothpaste has a good taste during brushing and after taste in your mouth. It makes you mouth feel clean and your teeth sparkling. The foaming action makes this natural toothpaste feel like any other toothpaste you’ve tried (something many natural toothpastes lack). The best part though is that my husband also likes this toothpaste. That is priceless. In the past, every time I tried a new natural toothpaste, I would slyly put a dollop on his toothbrush to make him would try it. He never has been happy with something about natural toothpastes – the color, the non-foam, the texture. Until now! I can gladly pronounce there is only one toothpaste tube in our bathroom drawer today! What a huge success! 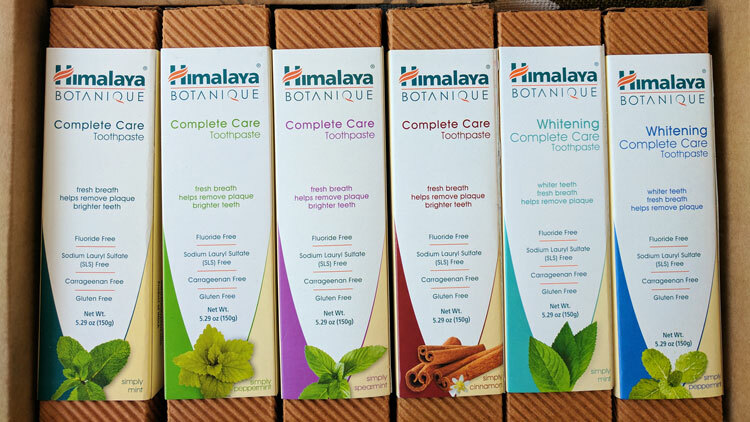 Himalaya Botanique Complete Care Toothpaste retails for $5.99 (a great value for natural toothpaste!). Find Himalaya Botanique Complete Care toothpaste online at Amazon.com or Himalayausa.com. You may also buy it in health food stores: Whole Foods, Sprouts, Natural Grocers Vitamin Cottage, PCC Natural Markets, Central Market, Mother’s Market, Earth Origins, King Soopers and many other small independent health food stores. Connect with Himalaya to see their latest products and get exclusive access to discounts and special offers! Follow Himalaya on Twitter, Facebook, Instagram and on Himalaya online. I use this toothpaste and it taste great. I don’t have to fuss with the kids to get them to brush anymore which is always a plus lol. Himalaya makes some really great products! I had no idea they also makes toothpaste. I will have to see if they are available here where I live. I see there’s complete care and whitening but what about sensitive? I can’t use regular toothpaste sadly.